Since March the UK government has been offering up a wild grab-bag of alleged evidence of Russian involvement in the attack on the ex-GRU colonel Sergei Skripal and his daughter in Salisbury, having followed through with the same pattern in a similar Amesbury incident earlier this month. Yet, they seem to have failed to substantiate their claims. Here are some of the most widely speculated pieces of evidence London has presented. 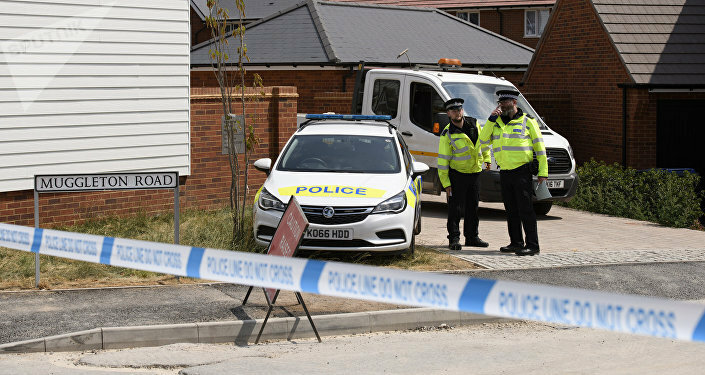 The police have suggested that a group of four people, including a woman, who is believed to be Russian assassin ordered to poison Sergei Skripal, was behind the Amesbury attack. Local media speculated that the police obtained those images from CCTV camera footage using facial recognition technology, which according to an investigative report by The Independent, proved to be only 2 percent effective. 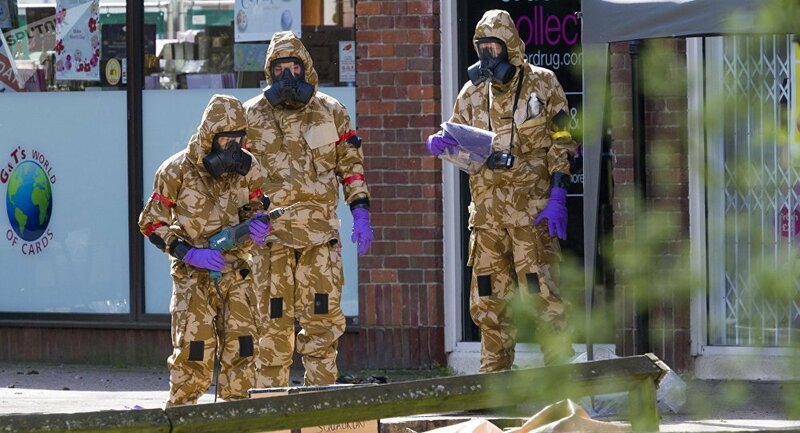 In a desperate search for the source of contamination in Amesbury, the police declared nearly two weeks ago they had discovered a small bottle that stored the deadly nerve agent the UK authorities call Novichok. In the meantime, British media cited Charlie Rowley’s brother Matthew as saying that the victim told him he had found “something that looked like a perfume bottle,” with his partner, Dawn, spraying the content on her wrists and then passing it to Charlie. The object that by a twist of fate appeared in Rowley’s apartment somehow “splintered or broke in his hands,” Matthew said – and yet the police later managed to find some bottle, ostensibly containing the nerve agent. Unnamed source close to unnamed British police officers tells unnamed Press Association journalist Britain knows the unnamed Russian agents who attacked the Skripals' doorknob with gel filled perfume bottle then went to central Salisbury to leave it in a park. Totally convinced. — Craig Murray (@CraigMurrayOrg) 19 июля 2018 г. Which wasn't Novichok when tested, but has become Novichok in the perfume bottle that magically relocated to Amesbury. — mikems (@socialistMike) 19 июля 2018 г. Meanwhile, Porton Down is right next door to where all this happened. I'd look for personal motives to be honest. — Paul Kite (@i_luv_con_air) 19 июля 2018 г. The bottle says MADE IN RUSSIA,naturally! — lynne leech (@lynneleech1952) 19 июля 2018 г. Earlier this month, British media cited sources in Scotland Yard as saying that “a two-man hit team with close ties to Russia” orchestrated the alleged attack on the Skripals in March. According to the sources, the police were sure they had made a “huge breakthrough” by finding the two suspects, who had ostensibly fled the country within 24 hours of the assault. Sergei and Yulia Skripal were found unconscious in March after allegedly being exposed to a toxin, later identified by the UK police as the lethal nerve agent Novichok, “developed in Russia.” Despite the initial claims that the two might never recover, they were discharged from the hospital, with medics saying they were no longer in critical condition. 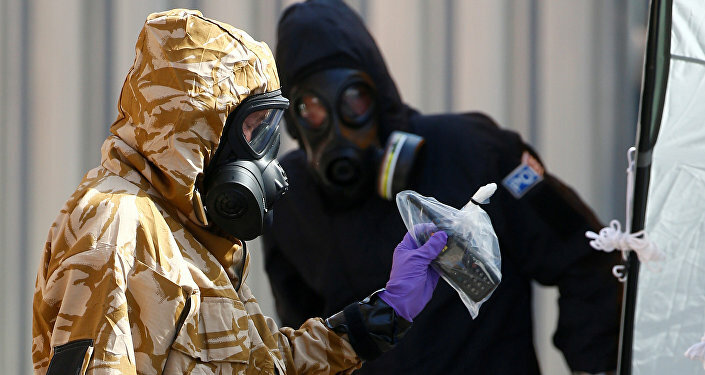 Immediately after the UK authorities reported that two people, later identified as Rowley and Sturgess, had been hospitalized after being exposed to an unknown substance in Amesbury, Home Secretary Sajid Javid claimed that it was the same nerve agent – Novichok – that was used against the Skripals. “It is now time that the Russian state comes forward and explains what has gone on,” he said. Javid was so convinced that Russia was behind the attack, that he failed to provide any evidence to support his bold accusations. He, however, added that London didn’t “want to jump to conclusions,” and that it wasn’t planning to impose additional sanctions on Moscow for the incident. At the same time, the police said that detectives have been unable to confirm whether the nerve agent was from the same batch. “They are unable to say at this moment whether or not the nerve agent found in this incident is linked to the attack on Sergei and Yulia Skripal. However, this remains our main line of inquiry,” the counter-terrorism office representative, Neil Basu, said early in July. 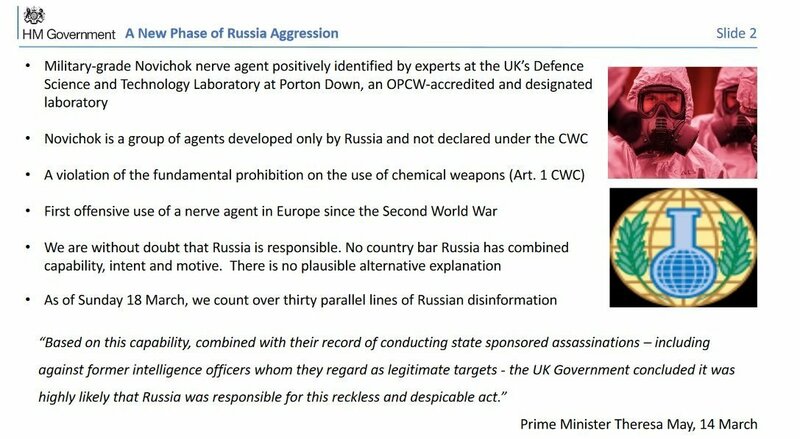 The UK authorities have turned to PowerPoint to make the case that Russia orchestrated the attack on Sergei Skripal – and the slideshow was leaked. Instead of presenting evidence of Russia’s alleged involvement or wait until the investigation is over, the British government simply concluded that Moscow was “without doubt responsible” just because “there is no plausible alternative explanation.” Very convincing.